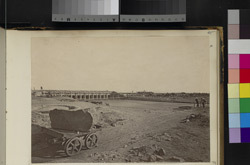 Photograph from Crofton Collection: 'Public works including the Manora Breakwater and the River Son canal system' taken by an unknown photographer, c.1871-73. The Agra canal, opened in 1874, was a major civil engineering project and the water was used for both transportation and irrigation. The canal drew its water from the River Jumna at Okhla, about 10km from Delhi, and from there it continued until finally joining the Banganga River about 20 km from Agra. Irrigation waters from the canal helped to lessen the impact of famine in the area by increasing cultivation. As irrigation was the prime objective of the canal, navigation on the canal was stopped in 1904.